A signature southern-Islay single malt with the typical massive peat-smoke - but also offering a dryness that turns it into a truly interesting dram. The nose open up with peat smoke with iodine and seaweed and a rich, deep oak sweetness. Dry peat smoke fills the palate with a gentle but strong sweetness, followed by sea and salt notes with touches of wood. Lapsang Souchong and fruity sherry. The dryness is at first offset by the sweetness of the sherry character. As the palate develops, oily, grassy, and, in particular, salty notes emerge in a long, sustained, aggressive, attack. A huge, powerful, bear-hug of peat. The driest of Islay malts, and an established classic. Massive peat. Ultra-intense iodine carries a shade more spice than of old. The fruity-sherry notes are clean, vanilla is much deeper. Beautifully layered. Peat so thick you could stand a spoon in it. Chewy iodine bolstered by sherry and big oak. A little spice lightens the grip of the peat and vanilla. Dries off with malt, dried dates...and iodine. A true classic in every sense that offers breathtaking depth. 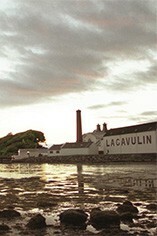 Lagavulin has been made on the same site, on the south shore of Islay since at least 1816. To most whisky lovers Islay means one thing, peat. Peat has fuelled life in the island for centuries, and there is an awful lot of it covering miles of bog in the west of the island. 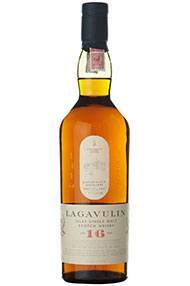 Lagavulin's barley is malted at nearby Port Ellen, where it is bestowed with it's characteristic peat reek. The other major influence of the rich flavoursome character of Lagavulin is the wood in which it matures, 16 years for the standard expression. Unlike most other distilleries here there is a reliance on mainly Spanish, ex sherry casks, which add to the ripe suppleness of the finished dram.